The Detective department is made up of several squads and sections dealing with specialized types of crime. This book contains twelve murder cases and its detection from Lalbazar Detective department which is written by IPS (Indian Police Service) officer honorable Supratim Sarkar.Details about Lalbazar Detective department and the book has been collected through the web (Open Source). Hope that readers will like this book. 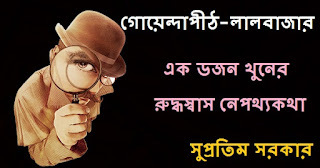 So read and enjoy the Bengali detective story book PDF. Remarks:-Read or collect Bengali PDF E-books, Bengali story books, Bengali novels, Bengali detective story book PDF, Bengali Magazines (Patrika) and translated (Onubad) Bengali E-books in PDF format written by famous Bengali authors.